Dock lines are used to secure the boat temporarily or permanently to a dock. They are also used to connect several boats when rafting. There are different dock lines for different purposes and various sizes of boats. The best material for dock lines is nylon since it is strong, durable, and can stretch when loaded. It also has impressive shock absorbing properties. Polyester lines are not suitable as they transmit shock from water waves; thus, loosening any hardware on the boat. Three-strand line. It is the most affordable dock line on the market. These lines are easy to splice, and they have a knobby finish. They are made of small nylon strands which are twisted to form three main strands which are twisted to make the final line. Double braids. They have an outer nylon surface and an inner nylon core. They can’t support big boats. Their strength is about half of the three-strand line. These lines are available in multiple colors. Therefore, you can choose the colors that match the patterns of your canvas. Mega Braid. It is a twelve-strand braid. It is ideal for boats above class 70’. This dock line is much harder to splice. The only colors available are black and white. Transient dock lines. These are suitable for temporary docking when the boat is away from the home port. Nylon lines with spliced eyes are preferable as they are ready to use. The eyelets are easily passed over the cleat. Choose the lines with the right length and a favorable diameter. Permanent dock lines. Most of them are made from nylon. These lines should be protected from chafe. Chafe is the wear and tear caused by rubbing dock lines on any hardware. It can be prevented by avoiding abrupt adjustments on the rope. It can also be prevented by the use of either a fabric chafe or leather gear on areas where the line is in contact with any hardware. If the dock has rings, the lines should be protected from chafe using shackles and eye splices. Also, permanent dock lines should be sized to fit the boat being secured. Bungee dock line review is based on the quality of the dock lines, length, and the weight it can support. These dock lines can easily secure your boat at the dock. They come with an inner cord which is 3/8” and is covered with a nylon cover of 1”. The nylon cover protects the dock line from UV rays which may damage the dock lines; thus, extending their lifespan. The dock line is machine sewn; therefore, it contains no metal. They are among the best bungee dock lines in the market today. 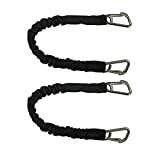 Boat Dock Tie Bungees have 9” loops on both ends which provide mechanisms for better attachment of the boat to the dock cleats. The dock ties are made in the United States. To ensure high quality, all lines are inspected by the Boat Lines & Dock Ties LLC. If you are an outdoor adventurer with a small boat or kayak, a premium bungee dock line is a good option for you. It is a heavy-duty line designed to serve various purposes on water and the dock. 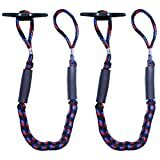 The ropes have a cover with an elastic core which acts as a shock absorber boat hardware the dock. One pack has two lines, a 4’ class which is 55” and can stretch up to 7’ class and the other one is a 6’ class which is 68” and can stretch to 10’ class. The two lines offer conveniences in various situations. The lines can be used on motorized and non-motorized PWC. They are also ideal for small boats. On one end, the dock lines have a corrosion resistant stainless steel clip. The other end has a custom spliced 10” loop. Therefore, they can be used on both freshwater and saltwater. The lines come with a float that makes the dock lines float on water even when they go overboard. They also come with reflective logos on the floaters and bright colors (green and yellow) which make them visible and accessible even at night. If you are tired with the tugging and the jerking caused by non-bungee dock lines on your docked boat, Extreme Max lines may be the answer to your problems. It will secure your shaft. Each end has a 10” loop and a slider to ease the attachment of the boat on the dock. Extreme Max dock lines produce three different sizes where adventurers can choose what’s best from them. The 4’ dock line stretches up to 5.5’, the 5’ dock line stretches up to 7’ and the 6’ stretches up to 9’. All lines come with a one-year replacement warranty. Extreme Max lines are suitable for all personal marine crafts. The line is designed such that it stretches as the boat is drifted by water and collapses when the boat gets too far. It is important to note that these dock lines are suitable for calm conditions and not for unattended or overnight boat docking. Rainier Supply Co was established by boaters with the aim of making products for boaters. The company makes boat accessories of high quality as they understand the needs of their fellow boaters. One pack comes with two lines. The adventurer can choose a suitable dock from the three sizes available. A 4’ class stretches up to 5 ½ feet. A 5’ class stretches up to 7 feet while a 6’ class can adjust up to 9 feet. These dock lines have a simple design which makes them easy to use. Tying a boat is easier and faster with these lines. The process of tying the boat involves slipping the eyelet over the cleat of the boat and dock and wrapping the slacks. Rainier Supply dock lines are made high-quality materials. They act as a natural snubber by releasing pressure caused by water movements on your boat. Each line has a foam bumper which keeps the line floating even when it gets overboard. The lines are ideal for small to medium-sized boats. They also work well with PWC, canoes, and jet-ski. 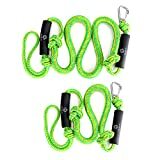 One pack comes with two bungee ropes. One line is on 4’ class and can stretch to 5.5’. The other line is a 6’ class and can stretch up to 9’. Both lines have a 10” spliced eye for docking the boat. Obcursco dock lines can support up to 2200 lbs. They are suitable for different situations and can be used to dock various types of boats. Obcursco dock lines are made of PE which makes them stronger and corrosion resistant. They can work in salt and freshwater. The quality of the lines is not affected by the sun. These dock lines have a stainless steel clip on one end. Obcursco dock lines are among the few lines that come with a protective film coat which prevent the boat from being chafed. Their shock absorbency and stretching properties are some of the reasons an adventurer may prefer these dock lines over the rest. It is the among the best bungee dock line for light crafts. Airhead dock line can absorb shock on the docking hardware such as the boat, docks, and cleats. 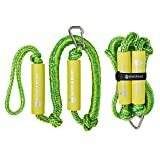 It has a hidden bungee cord inside the rope which acts as a snubber by automatically releasing pressure caused by water movements on the dock. Each line has two foam floats which provide sliding adjustments on both ends for easy docking. Airhead dock lines can support a maximum of 4,000 pounds. Each rope measures 4 feet, and it can stretch up to 5 ½ feet. The eyelet fits perfectly through the cleat of any PWC. You can adjust the size of the loop by pulling back the plastic sleeve. To tighten the connection, slip the plastic sleeve forward. Airhead dock lines wear out with continuous exposure to sun and water. The length of the dock line when relaxed is 24” and it can stretch up to 48’. It is covered with a one inch thick UV protective cover to prevent damage by sun rays and increase its lifespan. 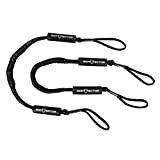 The line has an inner bungee cord of 3/8” made with heavy duty material. Bungee cord acts as a built-in snubber which absorbs pressure generated by water movements on the dock. The cord has a stainless steel hook on both ends and a double stitched loop. The hooks ensure quick linking to the dock. 316 stainless material makes the hooks strong, convenient, and durable. One pack comes with two dock lines. Amarine-made dock lines are ideal for maintaining a boat on the dock and when launching the boat offshore. The lines can support up to 300 lbs. In addition to securing small boats, Amarine-made dock lines can be used for other purposes like securing the horse and bicycles. These dock lines are long enough to secure a boat. They measure 4 feet when in stationary mode and can stretch up to five and a half feet. Botepon dock lines have a tensile strength of 2150 pounds and can support a weight of up to 4000 pounds. They are ideal for PWC, kayak, jet-ski, and pontoon. Bungee dock lines have high elasticity. They are not prone to becoming loose even when the boat is bumped by water continuously. The lines can absorb shock to any hardware on the boat including pylons, cleats, and the boat itself. Botepon dock lines are convenient. Each pack contains two bungee dock lines. They keep the boat anchored on the dock, and people do not have to pull it closer when getting out or boarding. The dock lines are easy to use. They have a sleeve that makes it easy to adjust the size of the loop to link to a wooden post or cleat. The maximum size of the loop is 5.2 inches. The lines have foam bumpers on each end to prevent the dock lines from sinking even when they go overboard. Each pack comes with two bungee dock lines. They are available in four sizes. The smallest is the 3006.2367 which measures 12”. Their strength can be compared to that of 10 ordinary bungee dock lines. The dock lines have a UV resistant cover to protect them from sun damage and extend their lifespan. Each end has a stainless steel clip which is corrosion resistant. The clips make anchoring easy. Extreme Max 3006.2367 is a multipurpose bungee dock line. They can be used to secure the horse, bicycle, and small boats. However, it should not be used for climbing purposes. They can support a weight of up to 300 lbs. Each line has an inner elastic bungee material. 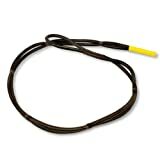 These bungee lines have multiple loops which enable them to accommodate any span of up to 7’. The stretch and slide properties simplify the docking process of both small and big boats. Each line has versatile loops which facilitate an easy and accurate connection between the boat cleat and dock cleat regardless of elevation and distance. The docks are ideal for temporary docking. To anchor the boat, place the end loop on the line over the cleat, stretch, and tighten the slider. Select a loop to place over the next cleat. These loops are perfect for a rafting party. 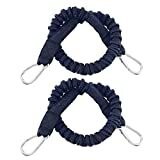 You can easily connect the rafts in minutes since you do not have to tie any knots. Not everyone is a scout with experience and knowledge of tying perfect knots. Therefore, these dock lines come in handy. Shock absorbing properties of the lines ensure the connected boats move uniformly on the water. Always buy dock lines made from nylon. Most adventurers want dock lines that match their trim or canvas colors. In this case, double braided dock lines will be ideal as they are available in six colors. To ensure your dock lines are durable, prevent them from chafe. Some dock lines rust faster in salt water; thus, their lifespan is reduced. If you are docking on salty water, buy docks that are suitable for that environment. The weight of your boat heavily influences the choice of a dock line. Consider buying a dock line made from a highly elastic material. A dock line that doesn’t stretch transmits shock to the boat’s deck, cleats and the dock. Pre-spliced dock lines are much better as the knot don’t get loose.